Not to be outdone by the ubiquitous cone, the sandwich is an often overlooked but more flavorful vessel for ice cream. 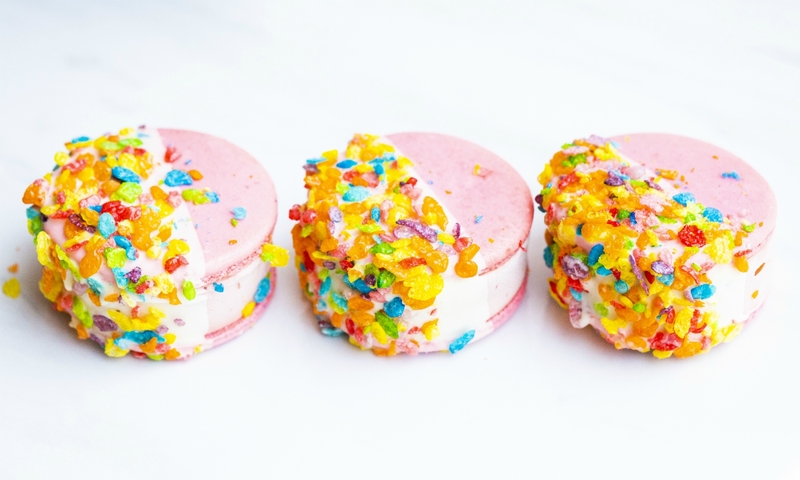 The ice cream sandwiches at MILK are the ones we’re drooling over right now. 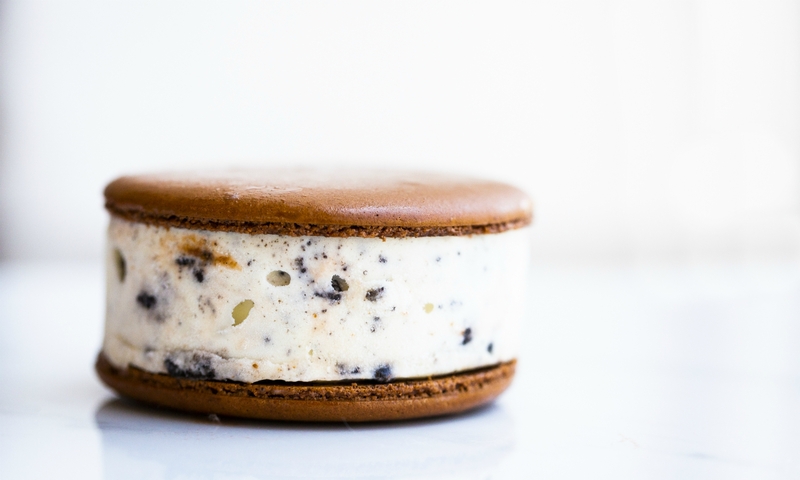 With locations in Fairfax and in Silver Lake, the folks at MILK make all their ice cream, cookies, and confections in house. 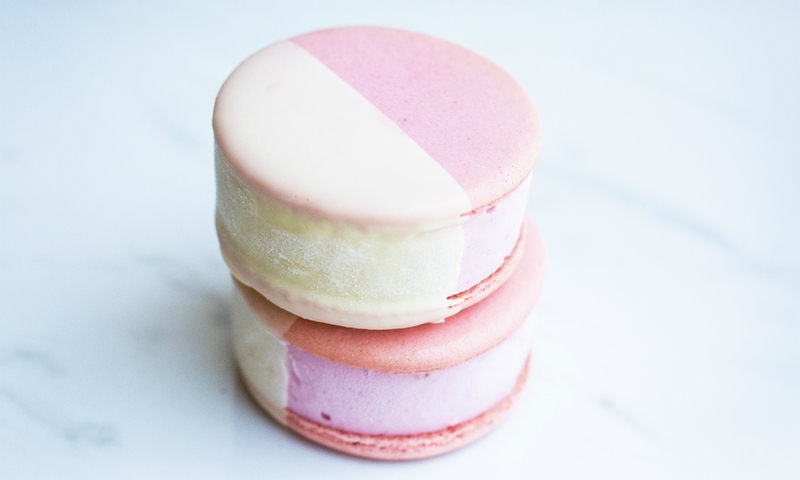 MILK’s huge ice cream sandwiches (seriously, they’re big enough to share) are all made using traditional macarons as “buns” and their homemade ice cream inside. We tried all of them—here’s how they stacked up. 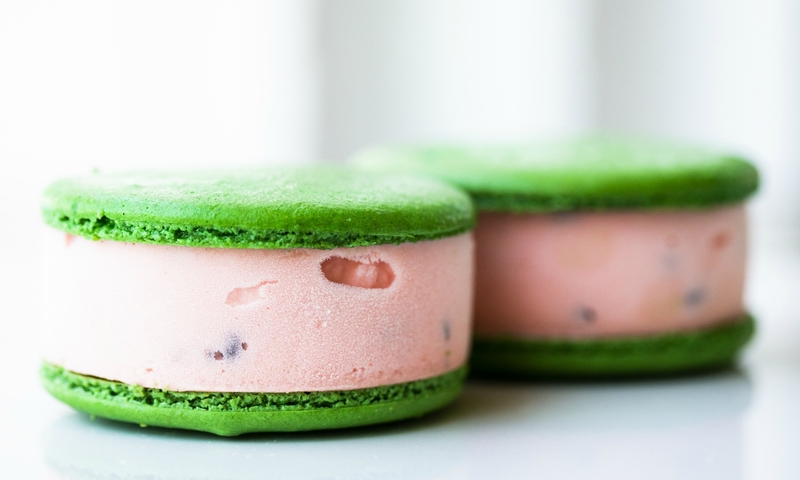 When it comes to ice cream flavors, green tea and rose are as divisive as they come—you either love them or hate them. In this sandwich, they’re swirled together for the ultimate bipartisan flavor. 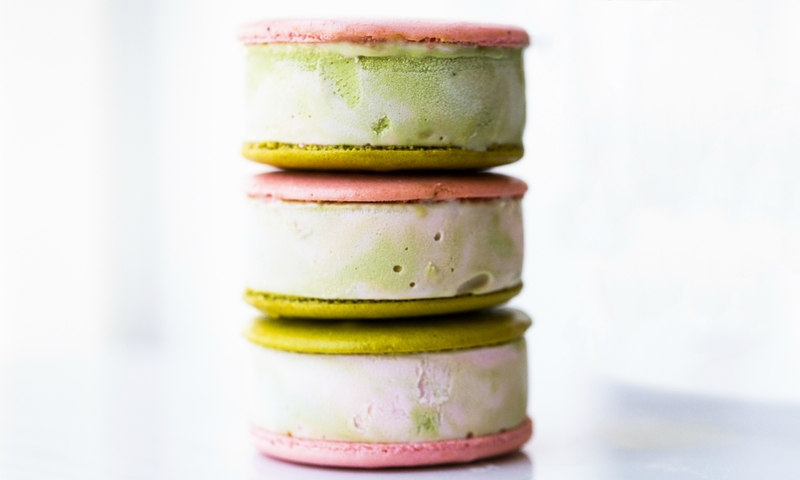 Made with ceremonial grade matcha powder and homemade rose water, the sandwich has a mild matcha flavor and a strong rose flavor. 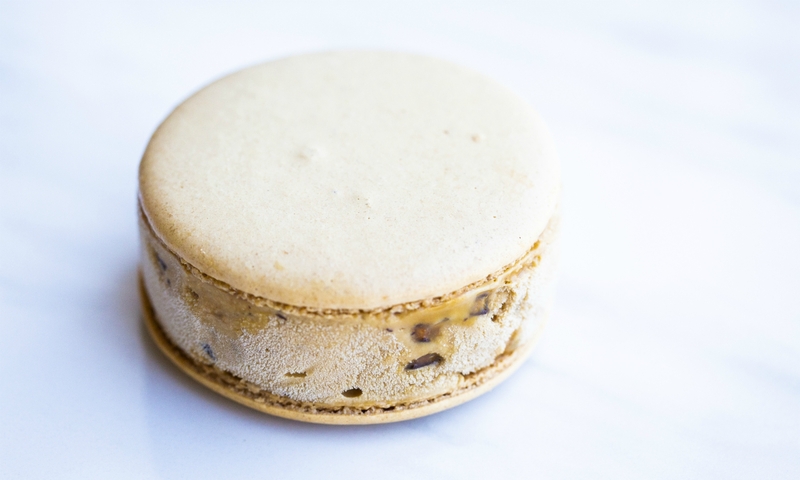 Fans of floral flavors will love this one, but we wish the matcha flavor wasn’t quite so understated. 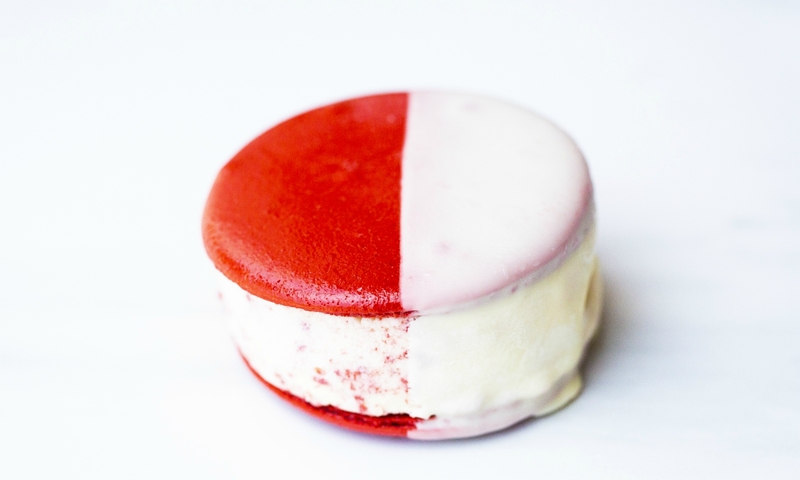 The ice cream in this sandwich gives off the subtle fruity aroma of fresh cut watermelon, and because MILK uses real watermelon, the flavor is spot on. It has a light-and-refreshing sweetness, totally like the actual melon. And don’t worry about spitting out the seeds. Those little crunchy bits are tiny chocolate chips that add a nice textural component. The overall flavor is more subtle than the other sandwiches, so if you’re looking for a more in-your-face assertive flavor, best to keep reading. 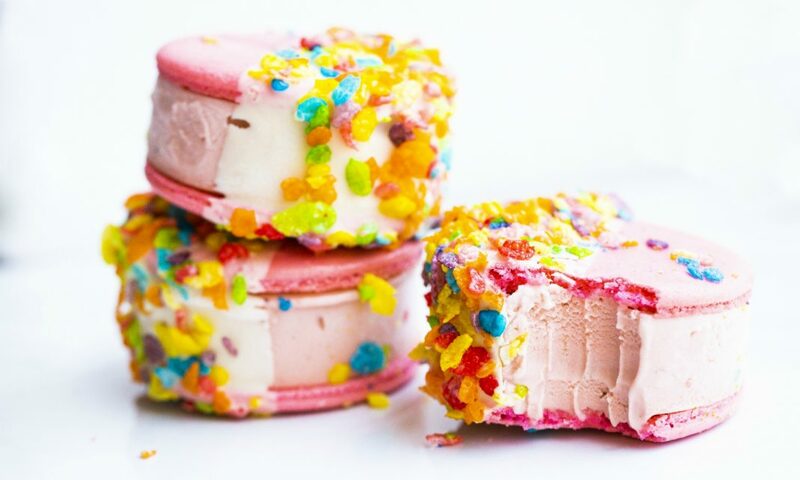 The Fruity Cereal sandwich is made with Fruity Pebbles cereal milk ice cream, dipped in white chocolate, and topped with crushed cereal. The bright colors make this one a crowd pleaser. Flavor-wise, it tastes exactly how you remember your Fruity Pebbles cereal milk tasting—which is to say, extremely sweet. 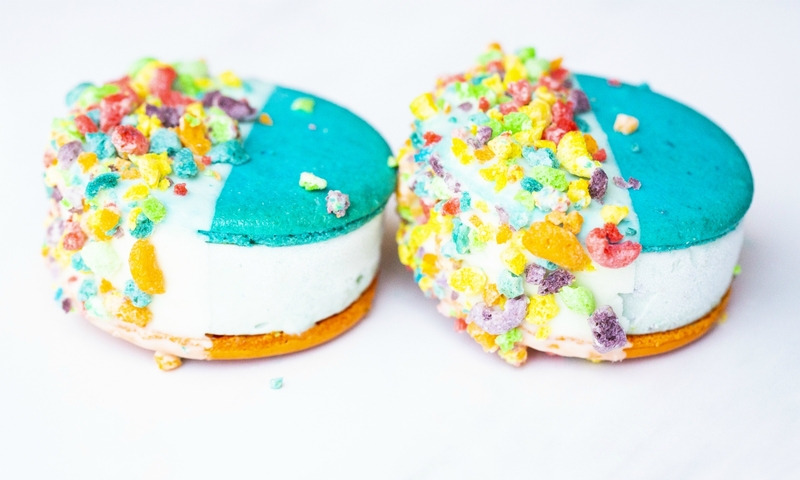 The Frooty Loops sandwich is made with Froot Loops cereal milk ice cream, dipped in white chocolate, and topped with crushed cereal. Both this and the Fruity Cereal sandwich have that sugary cereal sweetness, although this one was slightly less sweet than the other one, which is why we bumped it up one spot in the ranking. This sandwich is even more colorful than the other cereal variety, though they’re both the most ‘Gram-worthy of the bunch with their exploding unicorn colors. You can find a cookies and cream flavor pretty much everywhere, but this one is a well-done take on the classic flavor. What makes this successful is the excellent distribution of cookie chunks. And they use real Oreos! 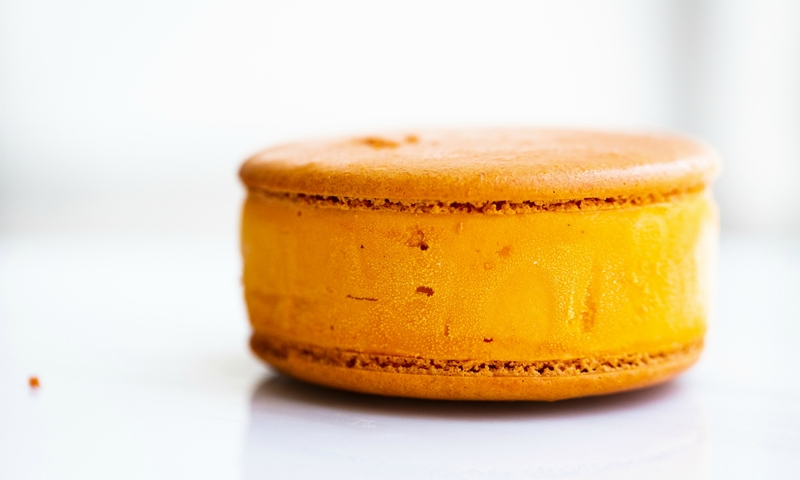 This classic flavor gets a sophisticated upgrade. It’s made with real strawberries and dipped in white chocolate. Taking a bite out of this is like taking a bite of a white-chocolate-covered strawberry, but without the seeds getting stuck in your teeth. 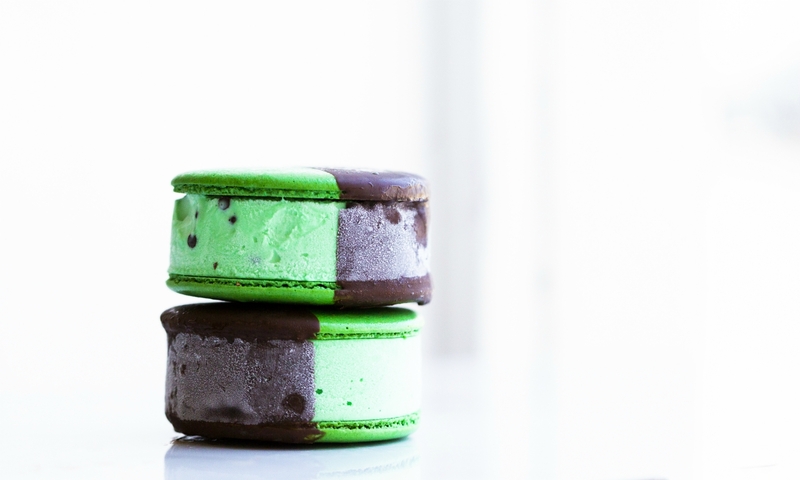 The Grasshopper sandwich is made with MILK’s mint chip ice cream and dipped in dark chocolate. This flavor is refreshing and light with a crisp minty sweetness. We especially loved the rich dark chocolate dipped side. Taking a “more is more” approach, there are so many chunks of red velvet cake in the ice cream that you’re essentially eating a slice of cake a la mode. There is no uniformity to the size of the cake chunks—there are some small flecks but also big mouthfuls. The texture is soft and tender with a luscious cake-y flavor, and the white chocolate dip gives it an extra butteriness that goes so well with the cake. You know you’re drinking an authentic Thai iced tea when you see that striking orange color and the flavor is sweet and a little bitter. The ice cream in the Thai Tea sandwich is a legit and intense version of an authentic Thai iced tea. The milky sweetness is balanced by the slightly bitter tea. With a flavor so rich, it doesn’t need any mix-ins or toppings. Our surprise favorite was the Coffee Toffee sandwich. It’s made with Intelligentsia’s Black Cat espresso, which means the coffee flavor is front and center. MILK’s crunchy homemade toffee is mixed in to add a gooey burnt-sugar sweetness. You don’t have to be a big coffee drinker to enjoy this sandwich. It tastes like a perky frozen latte and will give you a sweet little pick me up.